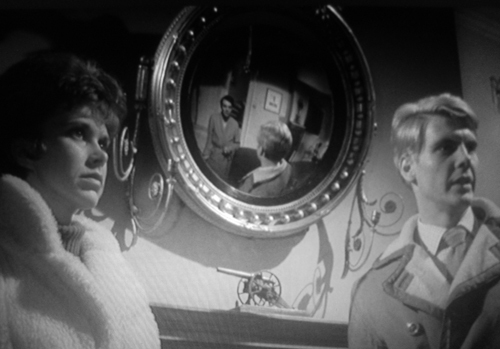 Last night I watched "The Servant" (1963) starring Dirk Bogarde and Sarah Miles. This is one of those films that leaves you staring at your television, mouth agape, wondering what the heck you just saw. It is eerie, uncomfortable, unsettling, disturbing and FANTASTIC. The movie begins with an unconventional job interview -- Hugo Barrett (Dirk Bogarde) arrives to find his potential employer (James Fox) passed out drunk on the floor. Now, Barrett is quite the interesting fellow -- he is at once reserved, shy and deferential and cocky, domineering and forward. 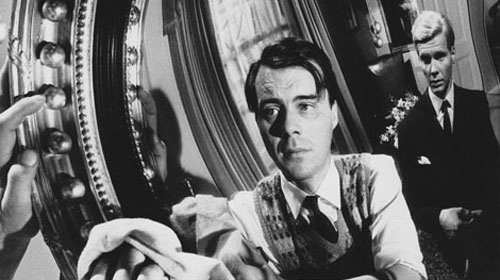 The character is so incredibly complicated it's no wonder that Dirk Bogarde won the BAFTA film award as best actor for his performance. The film is really presented in two parts. 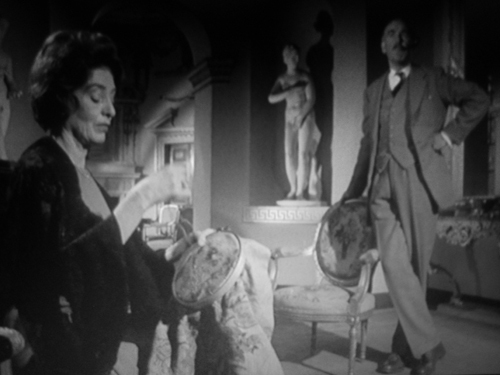 The first half is sort of coy -- you get an idea of what's going on in the plot, but it isn't entirely clear, and it isn't especially sinister. Then the second half just hits you like a ton of bricks! It's dark, heavy and definitely not coy. One of my favorite things about the movie was the use of reflections -- I didn't take screenshots of all of them (there were too many!) but my favorites included this fish-eye mirror in the drawing room. It was the perfect way to depict the twisted, fun-house kind of shennanigans going on inside this house. 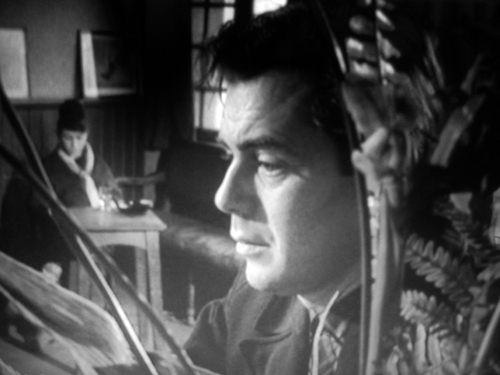 This wasn't my favorite Dirk Bogarde film (that honor still belongs to Darling, though this came very close) but I think it was my favorite performance. His character doesn't evolve in the film, it is revealed. In the beginning, Barrett is a devoted manservant, eager to cook meals and carry trays. But little by little he becomes a bit bossy. The walls should have red and fushia wallpaper. The master shouldn't have fresh flowers in his bedroom. He doesn't approve of new cushions for the couch. And you know, he really could use a maid to help him out around the house -- and his sister is just the girl for the job. As the film progresses, Barrett gets stronger and stronger while James Fox's character gets wearker and weaker. By the end of the film, Barrett has shown his real character, a far cry from the meek, eager servant we met at the beginning. Really, the transition is stunning. 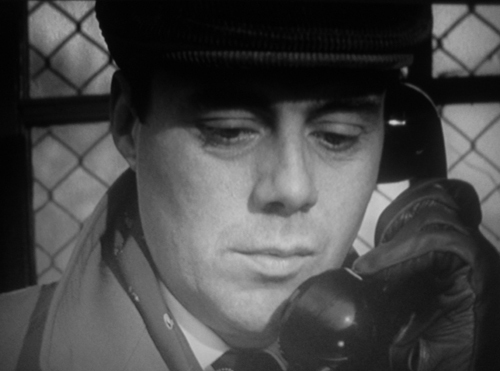 Furthermore, it is amazing that Dirk Bogarde really does not have that much dialogue or screentime at the beginning of the film. Yet whether he is physically on camera, or simply lingering in the thoughts of the other characters onscreen, his character is a constant presence in the movie. Last year I saw an interview with Harold Pinter on Charlie Rose (re-aired after he passed away) and was very enchanted with him -- I've wanted to watch one of his plays or films ever since, and I'm very happy that this was the first one I got to see. He wrote the adapted screenplay for the film, and if this is any indication of his style I am just itching to see more! Pinter also wrote Accident (which, like The Servant, also stars Dirk Bogarde and was directed by Joseph Losey) so I can't wait to see that now! A lot of movies can make you cry, laugh or smile gleefully at the end. But it takes a really special film to leave you staring at your television, mouth agape, wondering what the heck just happened. Can I just say, I want to BE Sarah Miles. Really. I remember seeing this in the 70's when I was studying Pinter. I remember liking it a great deal. Hmmm... going to have to check it out again. 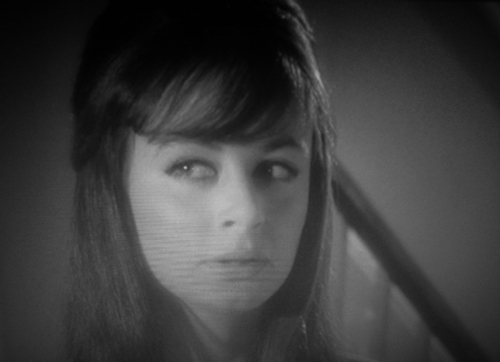 And I must say, there was a time I wished all women were Sarah Miles. I highly admire your adoration and commitment to Dirk Bogarde. Ohh sounds quite appealing! Even though, I haven't seen many of his films, I love that Dirk was able to play so many different types of characters. It's so interesting to see what an actor can do with more obscure types of characters. Great blog post! Haha, what a coincidence! I just read about this film today and wrote to you about it in your previous post, wondering if you had seen it! It looks really intriguing (and you wrote a great review), I have to see it really soon! I have never seen it, but your review has me thinking I should really look for it! 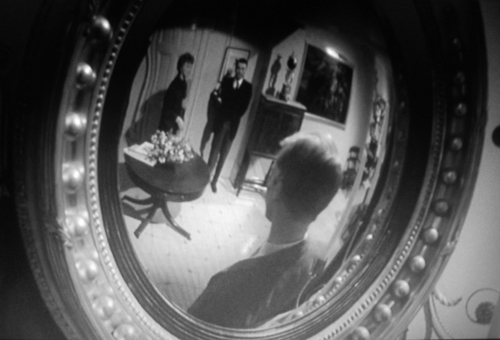 I'm glad you mentioned all the reflections--that's one of my favorite things about The Servant. I also loved the Dankworth soundtrack--very slinky and elegant, but filled w/ the sort of quiet doom you see in the movie. You've described the movie so well that I think I've got to see it again! 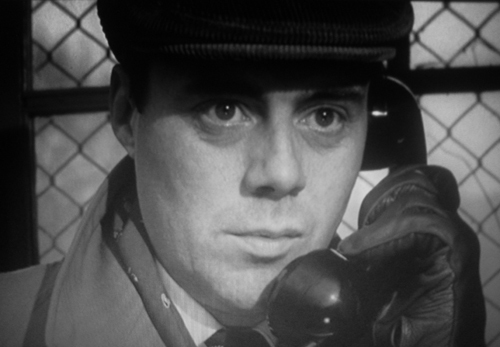 Great site, you have some terrific stuff on Dirk Bogarde here, I do a lot on him too on my blog. (I met him briefly in 1970). 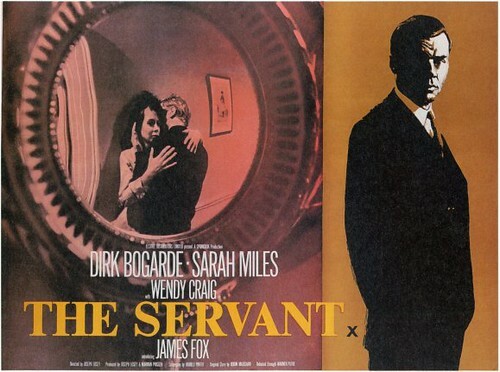 I was actually at a special screening of The Servant last Sunday, 24th March, with a Q&A with James Fox, Sarah Miles & Wendy Craig afterwards, whic was pretty special. Great to see them again, in their 70s now. The film is out on Blu-ray next week, with lots of extras and interviews, for its 50th Anniversary, as my my own blog posts.